When last we spoke to the Rural Alberta Advantage, Canada’s premier suppliers of hard-driving indie folk and small-town nostalgia, they were a friendly, fresh-faced band with the glow of recently signing with Saddle Creek for their debut album. Recently at South by Southwest, they were a friendly, fresh-faced band with the glow of recently dropping their outstanding sophomore album. They look good in glow. Ca Va Cool’s Josh Penslar joined forces with Mathew Katz of Colorado’s KDNK Radio in an alley behind Home Slice Pizza in Austin, Texas to talk with the trio about their SXSW experiences, being Canadian in the States, the proper relation between Texas and Alberta, and what covers the band is secretly prepared to play if you ask nicely. Ca Va Cool: How’s the festival been so far? Exhausting at all? Amy Cole: I dunno, we’ve been good. Yesterday we played our shows and we went back to the house we’re staying in and went to bed at an extremely reasonable hour. I think it was 11 PM. [Laughs] We’re really boring. But it was good for us, because now we’re energized for the rest of the fest. We had a long drive the previous day, so now I think we’re ready to really experience things. CVC: Where were you guys coming from? CVC: That’s a big one. So I hear you’ve played South By before. How does this year compare? Amy: I just say South. Paul: Sometimes we’re just like S-X. Amy: You know what I mean. Paul: Every year is fun here. Our first year was definitely special cause we came down and got signed. So every year after that is a bit of a disappointment because we can never top that experience. But it’s still really fun and everyone keeps coming out to our shows. We’re playing like six shows, so the fact that there’s people there at every single one, that’s crazy. CVC: So this festival really helped make you guys. Nils Edenloff: Oh definitely. Our very first show that we played at South By Southwest – it was the eMusic showcase [in 2009], we played after Girls and before Grizzly Bear at the Central Presbyterian Church. It was kind of our big unveiling for all the US audiences. There was a bunch of press people there, and that led to us meeting Saddle Creek. We had been in talks with them before but, you know. They were at this show, though they didn’t tell us, and that’s where it led to. CVC: Speaking breaking into the US – a lot of the content and tone of your songs is very Canadian, or at least that’s what we hear because we’re Canadians. How has that been coming across in the US? Nils: It’s been going really well. I think a lot of our music isn’t really specific. Though you can be Canadian and kind of get some of the inside messages. You have that connection to home. But at the same time a lot of the music and a lot of the themes that are explored in there – it’s a lot about growing up, getting old, being alone, moving on, just things like that, and those are universal themes. During one of our first couple of shows in New York, a guy came up to me and said, “I don’t know anything about Alberta, and I’m just putting this out there: I don’t care. The songs speak to me.” I think there’s a lot of people like that. Moving from a small town to a bigger city, so many people do that. So many people are going through the same things. Paul: Plus Texas is kind of American Alberta. Oil and conservatives and cowboys. So I think people here really relate. Nils: Only here. All the things I just said, it was only about Texas. CVC: I’ve always heard that Alberta is Canada’s Texas, not the other way round. Paul: Nope. Other way round. CVC: So about people relating to small towns – You’re from Edmonton, which is no, you know. Does it have that same kind of small town feel to you? Does it inspire you in the same way? Nils: Well, Edmonton in relation to Toronto is a much smaller city. I was born in Edmonton but I moved to Fort McMurray, which is five hours north of Edmonton, and when I was growing up there it was about 35,000 people. There wasn’t a good record store, there was no good way to find music, and all those sorts of things. And also my dad’s from a small sort of rural farming town, and we had a farm there, so a lot of memories I have are from southern Alberta, growing up and going to the cabin that was basically a shed. So it was like, you can stay there, or you can move on, go for different things. You kind of grow into the space you have. CVC: Do you think your music is going to continue being about that Alberta experience going forward? CVC: It’s in the band name. Nils: Exactly. I think I’m always going to focus on those sorts of experiences whether or not it’s so, you know, obvious. I can’t really say that because people will think we’re a one trick pony or something. I think the next record will focus on flexing some different muscles. CVC: You guys said before that it’s always been a little bit disappointing at South by Southwest since you’ve been signed. What are you hoping to accomplish now that you’re here? Paul: Massively disappointing I think is what I meant. Paul: I’m having no fun at all. Amy: Let’s just go home. Paul: What was the question? CVC: What you’re hoping to accomplish here. Paul: That’s the thing. It’s cool to come here and not have to accomplish something. We put out a record and we just want to play for people. That’s all we came to accomplish. I feel for all the unsigned bands that come here and are trying to make something happen, because we got very lucky and we got exactly what all of those bands are looking for. For them, I hope that happens, but for us, our record’s out and we wanna play it for people. Nils: I think that being said, there are a lot of people there that haven’t had a chance to familiarize themselves with our music or see us play live. We are trying to expand our audience base to other people that haven’t… oh my god. Nils: Um, yeah. So that’s the thing. There are so many people that descend on Austin not just from the States. There’s people from all over the world coming here, and to be able to register with them is what you hope for. CVC: Between Hometowns and Departing, what would you describe as the biggest difference? Amy: The second album was us knowing who we were and what we’re doing. That we’re not crazy to be a three-piece band without a bass player. On Hometowns it was like, let’s just put some cello on this song, let’s try some stuff. But now, we do what we do best and put it on the record. I feel like it’s a more confident record. That’s the biggest difference overall. CVC: So now you know who you are. Who are you? Paul: [Laughs] Well, we’re the three of us. There’s all kinds of instruments on Hometowns that aren’t in our live show, people who might have been part of the band at various times. But Departing, literally everything that’s there is us doing it. We can play those songs live – that’s how they sound live. So that’s what it’s about. We are the three of us and we’re playing this music. CVC: Something we got to experience on your last tour was ‘Eye of the Tiger’. I’d like to know what inspired you to cover that song rather than… anything else. Nils: It started from an open mic night. For a time Paul and I were hosting this open mic night and playing for nobody. It gave us a chance to get better at playing, to discover how we could make the sort of music that we’re now making, and at the same time, because no one would come to this open mic night and it was terrible. Nils: It was in Toronto. In the East End on Parliament, the Winchester. It’s now a Tim Horton’s. So because we had to play for three hours to get our $50 worth of beer and food, we’d have to be able to fill it up with not only our own stuff that we were writing, but covers. We wanted to do stuff that people would recognize but also that we didn’t feel gross about playing. I’ve always liked trying to find songs and make them our own without doing a straight-up cover. I really love M. Ward’s ‘Let’s Dance’. I didn’t even know it was a cover until later on, he just owns it. It’s so completely removed from the Bowie version. I really find things like that inspiring. CVC: Any new covers on the way? Paul: We mostly have been mining stuff that Nils used to play back when were hosting the open mic night. There’s a bunch of stuff that he hasn’t busted out. He used to cover the Silver Jews. Amy and I have all these favourites from those days and we’ve been trying to push him to bring some of those out. CVC: What are the favourites? Paul: There’s that one, there’s the Silver Jews cover, there’s… can I reveal this? Amy: Yes! Styx Styx Styx! Mr. Roboto. It’s so good. It’s amazing. Paul: I want someone at a show who’s reading this to call for it one day and really put pressure on Nils. Amy: It’s my favourite one of all the covers. There’s just so much buildup and the payoff is amazing. CVC: Can you play it today? Nils: I haven’t played it in so long, I almost forget. I need to remember how to play it, that’s part of the problem. CVC: We can print out the lyrics for you. Nils: I think part of the problem is… [Laughs] I never really… when I would be learning songs, trying to cover them, I would print out the lyrics and write my own music to it. I can’t even remember, I wouldn’t even look at the chord changes. I just sort of do my own thing. I completely forget what chords I was doing. I would need to do a little bit of soul searching. Paul: We did ‘Just What I Needed’, we had a bunch of them. We’ll gradually roll them out over time. I kind of love the idea that all the covers we play are songs that we used to play back then. It’s kinda wicked. Nils: We do have a new album out, you know. So we have a lot of material to play. But I think we’ll find a way to work in covers at some point. CVC: I like it. One last question: have you guys discovered anyone at South by Southwest that you want to give a shout out to? Any up and coming acts? 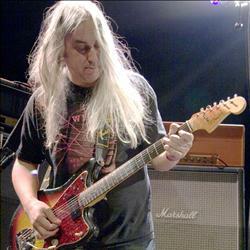 Paul: Yeah, this guy J Mascis, I think he’s really gonna be something someday. Amy: He was really good. Look him up. Amy: Yeah, but for real. And our friends that we toured with, Pepper Rabbit, we just watched them today and they’re amazing. We love them so much. When we ran into them they were like, we’re playing our sixth show today! They’re crazy. It’s crazy. If you can see them, do it. Nils: Keep an eye out for them the next time they come through your town. Paul: Our producer just saw DVAS and said that was amazing. I thought they were Toronto, maybe they’re Edmonton. They’re Canadian and really great.